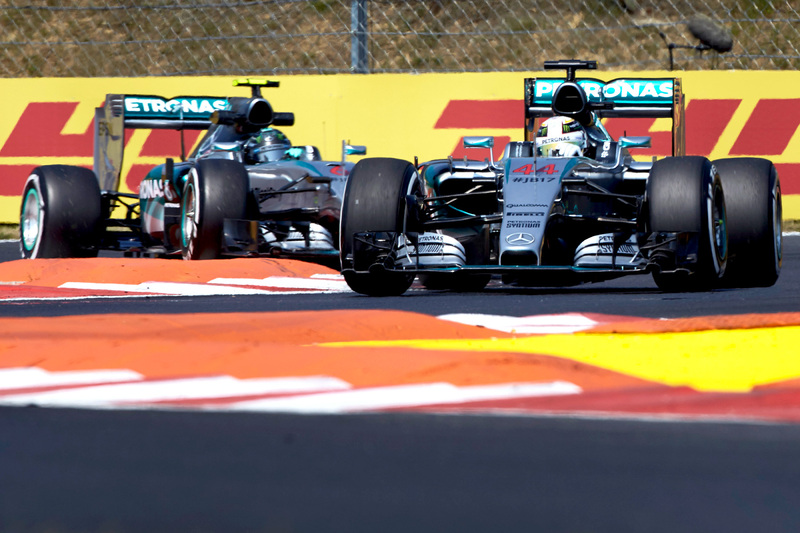 Lewis Hamilton has dominated qualifying for the Hungarian Grand Prix by taking pole position by with a margin of more than half a second over teammate Nico Rosberg. Hamilton looked better suited to the circuit than Rosberg all weekend and confirmed as much by setting a time good enough for pole on his first qualifying run before putting the boot in on his second. Though ultimately academic, Rosberg was on track to beat Hamilton’s first Q3 lap time with a solid first sector time, before losing time in the second sector and locking up in the last, sealing his fate. Rosberg will be left to wonder what tools he has available to him to overturn a weekend-long deficit to his teammate in time for tomorrow’s grand prix. He complained of understeer throughout qualifying and has been unhappy with the balance of the car since Friday, spending much of Saturday morning’s practice session tweaking his suspension in an attempt to remedy his malaise. Mercedes has been wary of threats from Red Bull Racing and Ferrari for much of the weekend, with the former in particular looking threatening in Friday’s long run simulations. Fittingly, Ferrari’s Sebastian Vettel qualified third and just four hundredths of a second ahead Red Bull Racing’s Daniel Ricciardo — admittedly both 0.7 seconds off the Hamilton’s pole time. However, both Hamilton and Rosberg will go into tomorrow’s race with the advantage of having an extra set each of the faster soft compound tyre, with the pace gap between the medium and soft compounds in excess of 1.5 seconds. Kimi Räikkönen, who was unable to do a qualifying lap simulation in practice three after a water leak robbed him of most of his Saturday running, qualified fifth and three tenths of a second behind his teammate. Valtteri Bottas will lead the Williams charge from sixth on the grid with teammate Felipe Massa in eighth, which is a marked improvement on the team’s pace in Monaco, which has a similar circuit profile. Sandwiched between them is Red Bull Racing’s Daniil Kvyat, who saved an extra set of softy tyres by using an old set for his first run in Q3. Toro Rosso’s Max Verstappen and Lotus’ Romain Grosjean rounded out the slowest of the top ten shootout, 1.6 seconds and 2.1 seconds off the pace respectively. Disaster struck just seven minutes into Q2 when Fernando Alonso’s McLaren prompted a red flag by stopping on track, compounding the team’s misery in the face of what was due to be a promising weekend for the struggling team. The Spaniard pushed the car back to the pits with the help of some marshals, allowing the session to resume just a few minutes later. His efforts were in vain, however, with McLaren unable to rectify the issue in time for him to resume the session, leaving him stuck with the slowest time of Q2 and P15 on the grid. Nico Hülkenberg and Sergio Perez were both eliminated in Q2 after losing almost all of Friday practice to a then unknown suspension problem, negating any advantage the B-spec car introduced at Silverstone should have brought Force India. The teammates in P11 and P13 were separated by Carlos Sainz, who was unable to deliver on the performance promise of his Toro Rosso car despite his opposite number, Max Verstappen, making it through to the top ten. It was a competitive session, however, with the red flag period disrupting the teams’ optimum plans and resulting in all drivers from Sebastian Vettel in third, with a time of 1:23.178, and Sainz in P12 separated by just 0.7 seconds. Behind Perez qualified Pastor Maldonado, who was told in no uncertain terms by the pit wall that a number of lock-ups on his flying lap were to blame for him not following teammate Grosjean into qualifying three. McLaren felt immensely disappointed to lose Jenson Button to the bottom five after hopes were high for a possible top-10 qualification at the Hungaroring. Honda is attempting to run the energy recovery system components of the power unit at 100 per cent power this weekend, but an energy deployment problem on Button’s final hot lap, ultimately missing the cut by one-tenth of a second. Button will start from P16 on tomorrow’s grid, ahead of Sauber duo Marcus Ericsson and Felipe Nasr and both Manor cars, with Roberto Merhi leading Will Stevens.